WC-200-205 is a plug-in overnight Wall Charger for Uniden-Bearcat BP-200, BP-200-205x, BP-205 battery packs. Charges NiCd in 12 hrs; charges BP-200-205x (1800mAh NiMH) in 24 hrs. 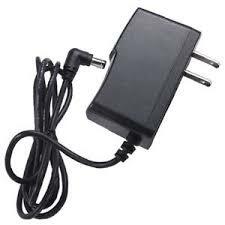 Plugs right into side of battery pack. Input: 110-120VAC@60Hz; Output: 12VDC @ 200mA. Actual charging rate depends on circuitry inside the battery pack - typically 75-100mA. Charging Plug Center hole polarity = POSITIVE +. 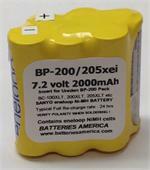 BP-200/205xei : 7.2volt 2000mAh replacement Ni-MH insert for your Uniden BP-200 & BP-205 battery pack. Made with SANYO eneloop cells, which are LONG LIFE, rechargeable. and PRE-CHARGED & READY TO USE.